After having a long brain storm session with some people interested in the future of Canadian Foreign Policy was inspired to write this thought experiment. 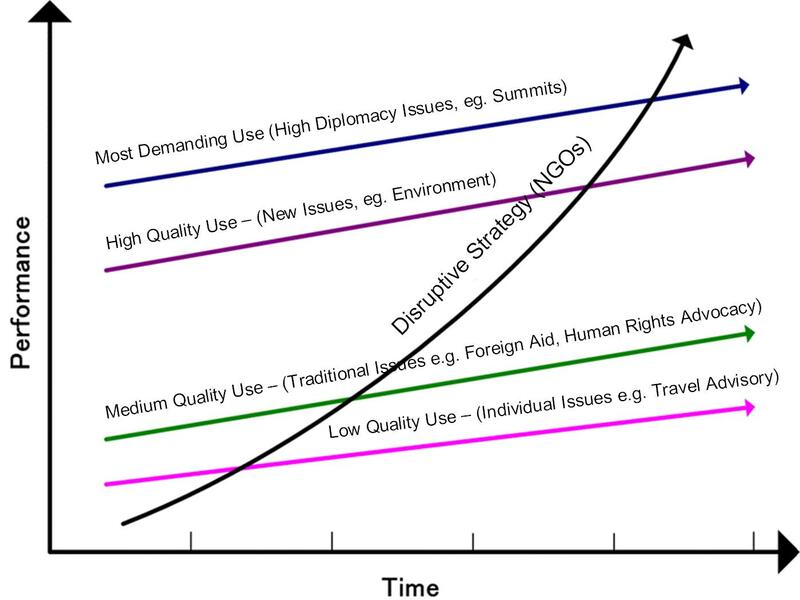 Perhaps a helpful way to frame our current Foreign Policy ennui is to see the Canadian Department of Foreign Affairs and International Trade (DFAIT) as facing a challenge analogous to that discussed in The Innovators Dilemma – sometimes referred to as disruptive innovation. Disruptive innovations are products or services that rather than simply evolving, overturn the existing dominant approach in a marketplace. Often the disruptive innovations starts off serving the low end of the market but it eventually matures and serves more demanding and larger clients pushing the established players out of business. What does this have to do with DFAIT? Consider the graph below (a play on the wikipedia page graph). It used to be that DFAIT served four segments – from low quality all the through to the most demanding use. And yet, over the past decades other actors – sometimes in the private sector, but more frequently NGOs – began to offer services that more effectively deliver what political masters, or more often, citizens, were looking for. At first this was true merely of the lowest tier, travel agencies and news groups began to tell people where was safe and unsafe to travel and so the government ceased being a primary resource for this. Then NGOs began to effectively deliver services in the more traditional areas of advocacy and programs. Increasingly the government has retreated from that space. More recently, you’ve seen NGOs actually take the lead by moving into new areas of debate and creating supporting documentation for critical actors. At the same time you’ve seen other ministries become significantly more active in the management of “international files” that overlap with their areas of focus (eg. Health or the Environment). This is classic innovators’ dilemma. A challenge to DFAIT from a community using a strategy that initially seemed marginal (and even helpful because it alleviated it of performing mundane tasks) has evolved into a true competitor, appealing (usually more effectively) not only for the hearts and minds of Canadians, but for the attention of other ministries and key influencers. The real question is how does DFAIT compete? Again this is a thought experiment – I’m regularly impressed by the work done my people (many of them friends) at DFAIT. But the department has suffered over the past decade. It should be asking itself: can a (and how should a) centralized bureaucracy compete against an ecosystem of NGOs and other actors? DFAIT may be able to retreat to performing in only the “most demanding use” areas – but there is no guarantee that even this space is completely safe (although the government will maintain a monopoly on certain areas). The real challenge as outlined in the Innovators Dilemma is that innovation is often difficult, if not impossible for the incumbent actor. One thing that gives me hope is that the department may shrink, helping it become more nimble. For example, I’m pleased to hear that International Trade may be heading over to Industry Canada. This makes all the sense in the world – can anyone today legitimately claim that there is a real difference between domestic and international industrial policy? Smaller, leaner, and more partner oriented. I suspect one way or another this is the future of Foreign Policy. The question is, can Foreign Affairs innovate its way into that space? The author of the innovators dilemma isn’t optimistic – but then they were writing about private companies that could go bankrupt, not government ministries that can live on as the undead for extended periods of time… hardly an outcome Canadians or our Foreign Service officers, deserve. This entry was posted in canadian foreign policy and tagged canada, canadian foreign policy, department of foreign affairs, innovation, NGO on November 19, 2008 by David Eaves. You may be too young to remember, but up until the 1980s, it was the Department of Industry, Trade and Commerce. Trade was hived off to the Department of External Affairs and voila — a series of new and evolving acroymns before returning to the start. Those interested in this post may also be interested in this article on Digital Diplomacy by Perrin Beatty who served in the Cabinets of Joe Clark, Brian Mulroney and Kim Campbell.